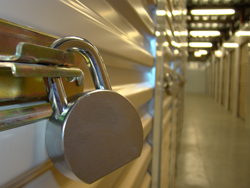 One of the main goals here at Mini Price Storage is to maximize the security of your belongings, so when choosing a lock to secure your storage unit we went with a top-end, industrial grade lock by American Lock. These top-end padlocks are described by American Lock as “virtually indestructible” and are intended for “maximum security.” They are constructed of hardened, chrome plated solid steel which is resistant to cutting, sawing, and corrosion. The shackles are made of a hardened boron alloy that offers superior cut resistance and security. The locking mechanism is a five-pin brass cylinder with dual ball bearings which resist picking, pulling, and prying with unsurpassed dependability. With Mini Price, the customer is the number one priority which is why we provide this top-end lock to our tenants for FREE. Still not convinced that Mini Price offers the best for less? Check out our other amenities and discover why you should store with Mini Price Storage.